Could lions solve a secondary predator issue in North Africa? The concept of secondary predator effects on degraded ecosystems is well established. If the large carnivores at the top of the ‘food chain’ are eliminated, then species lower down the pecking order are given a free reign to devastate prey species or the vegetation, if they are grazers (Borrvall and Ebenman, 2006; Duffy, 2002). By inference the presence of primary predators controls the trophic levels below them in the ecosystem. Whilst large carnivores are necessarily rare, from a trophic, or food energy transfer, perspective (Colinvaux, 1990), they appear to have an amplified impact on the behaviour and presence of other species can be a significant moderating effect in ecosystems. A recent study identified that even perceived presence of large carnivores reduces the feeding routines and impact of secondary predators in particular in experiments with racoons (Suraci et al 2016). Do these observations and phenomena relate in any way to the pressures on ecosystems in North Africa? 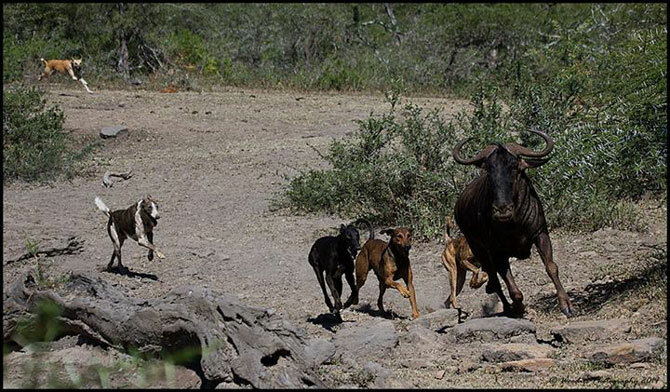 Clearly, land use by mixed flocks of goats and sheep would be changed (to some extent) by the presence of large carnivores, although how this would affect long term landscape recovery is unclear (without some system to manage those flocks). There also is a suspicion that some Barbary macaque populations are be impacted by predation from feral dogs, particularly causing losses in infant monkeys. Could lions provide an opportunity to deter overgrazing or the presence of feral dogs in those habitats of Barbary macaques? Butynski, T.M., Cortes, J., Waters, S., Fa, J., Hobbelink, M.E., van Lavieren, E., Belbachir, F., Cuzin, F., de Smet, K., Mouna, M., de Iongh, H., Menard, N. & Camperio-Ciani, A. (2008) Macaca sylvanus. The IUCN Red List of Threatened Species 2008: e.T12561A3359140. http://dx.doi.org/10.2305/IUCN.UK.2008.RLTS.T12561A3359140.en. Downloaded on 26 February 2016. Colinvaux, P. (1990) Why Big Fierce Animals Are Rare. Penguin Books. This entry was posted in Conservation, Ecology and tagged ecosystems, predators, reintroduction on March 4, 2016 by Simon Black.